Olentangy’s Alex Sieve puts up a shot between Orange’s Ryan Cutler (4) and Bryson Lane (10) during the first half of Friday’s OCC showdown in Lewis Center. There are no easy wins on the Olentangy boys basketball schedule – especially against rival Olentangy Orange. 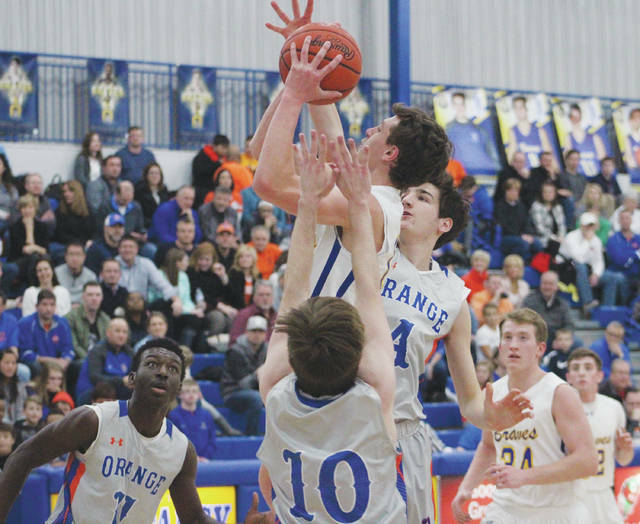 But, Olentangy fought back from a 15-point deficit to finally hold Orange off 87-84 in double-overtime on the strength of 40 points from Sean Marks. Unlike the first meeting, which took two buzzer-beating three-pointers at the end of regulation and overtime, Olentangy made its biggest shots with time left on the clock. Marks converted an and-one with 22 seconds left to give Olentangy its first lead of the game at 66-64. But, Orange’s Bryson Lane drove the lane and knocked down the tying basket with 7 seconds left to send it to overtime. Alex Sieve, who had 18 points, buried a three to give Olentangy a 74-71 lead in the first overtime. The lead stood up until Luke Ballinger knocked down the tying three with hands in his face at the top of the key with 9 seconds left to tie it 76-76 and send it to a second overtime. Jerred Kinnaird knocked down 1 of 2 at the line to give Olentangy a 77-76 edge and it never trailed again. Olentangy knocked down 11 of its 14 free throw attempts in the second overtime to account for all of its points in the period. Kinnaird had 14 points for Olentangy (10-9, 2-7) and Kyle Milliron chipped in nine. Orange jumped out to a 9-2 start on a Ballinger three and baskets by Lane, Jalen Bethel and Matt McCollum. Bethel had eight of his 18 points to help Orange to a 27-12 lead midway through the second quarter. Olentangy fought back using a 9-3 run to close the half down 32-24 led by Marks, who scored 11 of the team’s 15 points in the second quarter. “I was just trying to get my team back to believing that we had a chance,” Marks said. McCollum led the Pioneers (12-8, 3-6) with 20 points, Lane finished with 19 and Ballinger added 14. Olentangy is right back at it today, hosting Thomas Worthington in non-league play at 7:30 p.m. Orange is off until Tuesday when it hosts Dublin Scioto at 7:30 p.m. in non-league action.